Since 2003 Frazier Cycling has been developing junior cyclists using a non-traditional program based on the "true" team approach to coaching and racing. We have pursued our mission to grow the sport of cycling, not by recruiting cyclists from existing junior teams, but by developing youth from the ground up into some of the best junior cyclists in the country. Our success in winning seven national championship titles since 2008 has led USA Cycling to recognize our program as a "role model for other clubs' junior initiatives." Over the years we have received many requests for help to start other junior initiatives from across the US as well as other countries. To this end we have documented our 10 years of experiences, tracked our stats, efforts, processes and are creating a set of Junior Development Tools. These tools are designed to facilitate the implementation and growth of junior cycling initiatives based on our program. 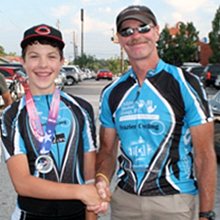 "Frazier Cycling does an amazing job working with junior riders of all skill levels." "I believe that is one of the most exciting athletic programs that I have ever witnessed." Our program is based on a team structure. Many ride together call themselves teams but they but may not function or race as a team. Our coaching philosophy focuses on the "true" team approach. We train and race as a team. We are a grass-roots program. We never cherry-from other teams; we develop our riders from "scratch" and turn them into national champions. We recognize that junior cyclists are not little adults and need to "have fun with their teammates" or else they will lose interest in a sport that is very demanding. Our program takes into account the physical, psychological, physiological and emotional needs of young cyclists as well as social considerations and gender differences. All of these aspects have been factored into our program. We have kept detailed statistics on the team as the members move from young juniors to teens. This data has proven very useful when customizing our training program and setting standards for the different age groups. It also allows us to share this information with other coaches. Contact Cathy Frazier at cfrazier@fraziercycling.com, 770-513-8640 to discuss how we can help you best. 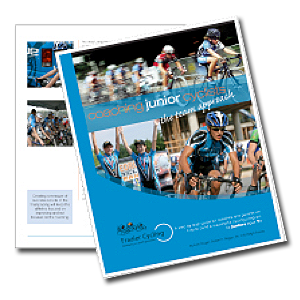 This 79-page spiral-bound manual written by Coaches Ralph Frazier and Kelli Rogan is a must for every cycling coach/parent wanting to start a team or advance an existing junior cycling program. The manual reflects how we built the Frazier Cycling junior development program using our team approach to training and racing. The manual is the foundation for all of our coaching tools. All of our products and services are built around the manual’s definition of our program. The manual's 12 chapters cover the steps to building a program by defining, structuring and incorporating junior elements based on physiological, psychological, social, gender and age considerations. Program implementation covers all aspects of getting started, creating program levels and skills, getting the athletes race-ready all in a positive atmosphere of teamwork, sportsmanship, character development and FUN. Also included is how to work with parents (a must) and ways to market your junior program. The unique toolkit section gives you hands on Frazier Cycling sample documents, results, data and assessments. Basic, Advanced & Post Race Comm. This is our 2-day clinic is held in Suwanee GA (30 miles NE of Atlanta). It is built around the coaching manual, Coaching Junior Cyclists – the team approach. Our manual documents the program's mission, coaching philosophy, organization, and implementation. The 2nd day of the clinic has 2 tracks – Track 1) starting from scratch - new programs and Track 2) established initiatives. The clinic includes a practice session and riding with the team. Participants are encouraged to bring their bikes to ride with the team. "What Frazier Cycling has accomplished is beyond impressive. They have truly created a program that is focused on the kids and embraces their love for cycling." "Very impressive group you have. I only wish I lived in your area and could give you all 4 of my kids." Coach Ralph Frazier is founder of Frazier Cycling and a full-time professional cycling coach. He has been cycling for over 35+ years. His background is endurance and marathon racing in SE Ohio. He is a published author, writes a regular youth column for Performance Conditioning, USAC's national coaching publication. In 2011 he was a guest speaker at the USAC Junior Coaching conference and his webinar on the Team Approach for Junior Cyclists is available through USAC. 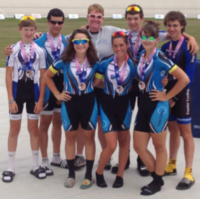 Coach Kelli Rogan is the junior development director at Frazier Cycling. Kelli Rogan was a co-founder of the Clemson University Cycling Team. She has an impressive racing history including collegiate road and track championships. Kelli was a member of the silver medal winning team at the 1995 US Olympic Festival. She has been coaching junior and masters level cyclists for ten years including the developmental kids programs at the East Point Velodrome in Atlanta and the Lehigh Valley Velodrome in Trexlertown, PA. NOTE: If you have several who are interested in attending, we can bring the course to your location when it is convenient for your group. Contact cfrazier@fraziercycling.com for more info. Skill building is a major focus of a junior program. We have taken the same lesson plans we use to train our junior team and organized them to make it easy to plan and structure weekly practices. Our lesson plans provide the cycling coach or parent with a complete description to teach the targeted skill; equipment needed, instructions to the team, adapting for varying skill levels, and time estimates. These easy-to-follow plans save you time and help you prepare for your training practices. They are designed for all ages, team training, and integrating the inexperienced with the experienced riders. Refer to the Coaching Junior Cyclists Manual for detailed information on how to use skills training to build a team. There are three sets of lessons.